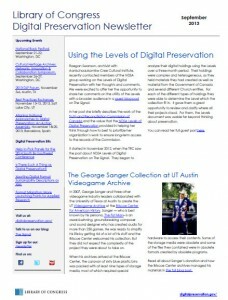 The September 2013 Library of Congress Digital Preservation Newsletter (PDF) is now available. What Is It That We Actually DO (at the Library of Congress)? This is a syndicated post. Read the original at The Signal: Digital Preservation 2013-09-06.